Wow, you’re really on a roll now! Great work on making it this far; you’ve made it a third of the way to completing the 90 Day Weight Loss Workout Plan. One month down and two more to go! Your clothes fitting more loosely. Your confidence in your ability to work out is way up. Your appetite is adjusting, and you have less hunger pangs. Certain muscles in your body are feeling harder and tighter. The #MoveMoreBurnMore lifestyle is feeling less like work and more like fun. Do this workout 5-6 days per week—Weight training, Plyometrics / Multi-Movement and Cardio—to get the most results. Integrating DUMBBELL EXERCISES and PLYOMETRICS/MULTI-MOVEMENT into your circuit. Reduce your repetitions. Do between 8-12 reps for each set. YOU WILL NOW ALTERNATE BETWEEN 3 DIFFERENT WORKOUTS. Total workout time: Weight Training, Plyometrics/Multi-Movement and Cardio = 45-55 minutes. Before you get started, here are a few quick tips and reminders. -Bring water with you for your workout. -Memorize the sequence of exercises for your circuit training WORKOUTS #1 #2 and #3. Plyo/Multi-Movement, Leg exercise, Triceps exercise, Plyo/Multi-Movement, Leg exercise, Triceps exercise. REST 90 seconds and do it ALL THREE more times. Total sets = 8 for each group (24 total). Plyo/Multi-Movement, Chest exercise, Biceps exercise, Plyo/Multi-Movement, Chest exercise, Biceps exercise. Plyo/Multi-Movement, Back exercise, Shoulder exercise, Plyo/Multi-Movement, Back exercise, Shoulder exercise. -Plan out your route for the circuit. Know where the equipment is that you can use for your circuits before you begin, and be sure to have some options in case your preferred piece of equipment is not available. You are going to continue doing circuit training, but we are separating the exercises and muscle groups in to THREE different workouts that you will now alternate between. REMINDER: You are lowering your REPS range for each set to 8-12 reps. If you can do more than 12 reps, increase the weight/resistance. Try your best to use DUMBBELLS, when available, for the majority of your circuit, but DO NOT hesitate to use CABLE or WEIGHT MACHINES if the DUMBBELLS you need are not readily available. The less time you spend resting between each exercise, the better. Remember, you are not going to do consecutive sets on one muscle group. As soon as you complete one exercise, move on to the next. 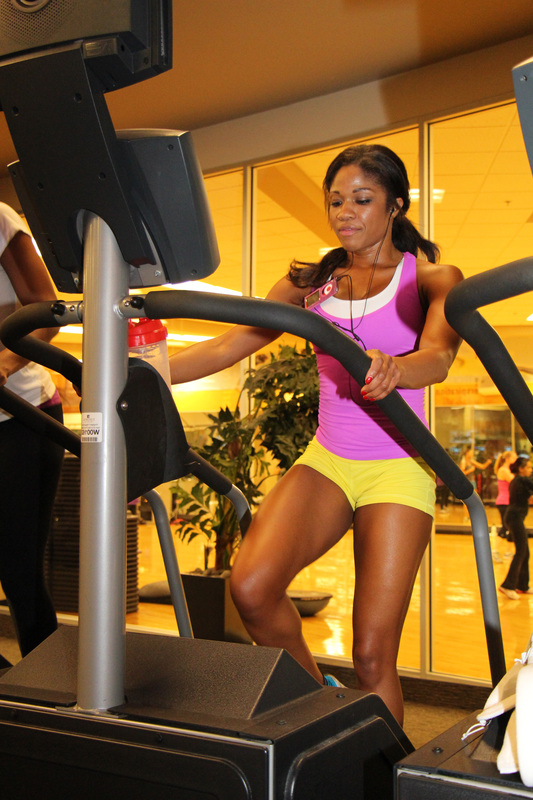 The quicker you move from one exercise to the next, the more calories and fat you can potentially burn. You will alternate between THREE different workouts—WORKOUT #1, WORKOUT #2 and WORKOUT #3—Do them consecutively so that you are not working out the same muscle groups two days in a row, and so that you are training ALL of your muscle groups. Free body drills, multi-movement or plyometrics – These are now added into ALL of your Circuit Training workouts. Choose any or all of the following exercises for the portion of your circuit that calls for PLYO / MULTI-MOVEMENT exercises. CIRCUIT = Plyo/Multi-Movement, Leg exercise, Triceps exercise, Plyo/Multi-Movement, Leg exercise, Triceps exercise. REST 90 seconds between each circuit. Do the circuit THREE more times. Total sets = 8 for each group (24 total). CIRCUIT = Plyo/Multi-Movement, Chest exercise, Biceps exercise, Plyo/Multi-Movement, Chest exercise, Biceps exercise. CIRCUIT = Plyo/Multi-Movement, Back exercise, Shoulder exercise, Plyo/Multi-Movement, Back exercise, Shoulder exercise. 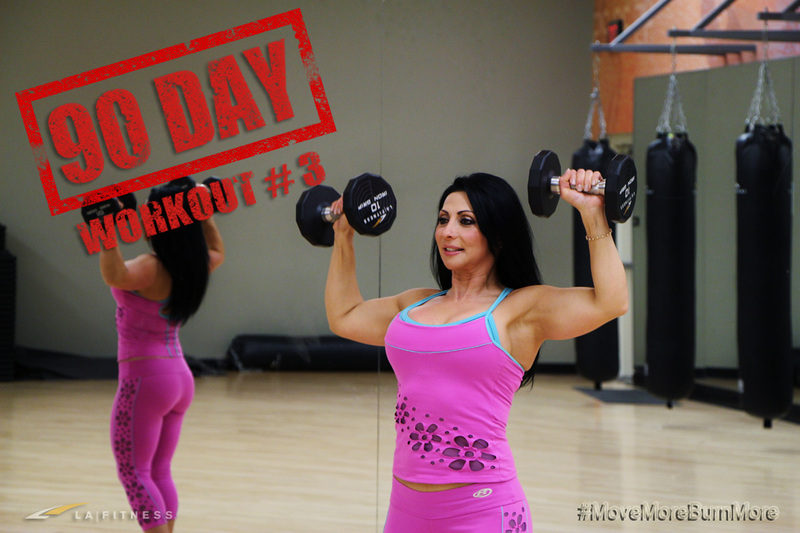 NOTE: For Days 30-45, You will do CORE/ABS separately from your circuit. 3 days per week, non-consecutive days. Example: Monday, Wednesday and Friday. 6 exercises. 3 sets of 2 different exercises back-to-back. Example: Plank and then bicycles. REST 60 seconds between each set of back-to-back exercises. Example: Planks, bicycles, REST, Planks, Bicycles, REST, Planks, Bicycles = Core / Abs COMPLETED. Pick any program and adjust the level to make sure that it is difficult, but doable. -Try to increase your levels every other day. -You should be breaking a sweat at the 8-10 minute mark. It’s time to really dial in your calorie counting. If you are losing 1 – 2 pounds a week, then you are right on track. Keep it up! If your weight is stuck, check your food log and make sure you are being HONEST and ACCURATE. Look for ways to cut out a couple hundred more calories and replace high fat and sugar laden foods with healthy options. Not logging your Calories yet? Check out Part 1 of our 90 Day Diet and Nutrition Weight Loss Plan – The First 30 Days. Also, look for the 90 Day Nutrition Plan to a Leaner You – Part-2 (Days 31-60) to publish next week, to help you continue losing weight and LIVING HEALTHY! Learn how to effortless follow the entire 90 DAY WORKOUT and LIVING HEALTHY. CLICK HERE and SUBSCRIBE today! Thank you for sharing 🙂 This looks really tough to do but I will certainly try this. I hopw that this workout plan will work for me. How do you do one set of a plyo exercise? You do it 8-12 times? Also, each “workout” consists of 4 “circuits.” A circuit consists of 6 exercises. Ok then. I am sure that none of the 6 exercises within a circuit are identical but are the circuits supposed to be identical? I’m guessing not necessarily. Excellent Series with great, detailed instructions! Keep up the awesome!